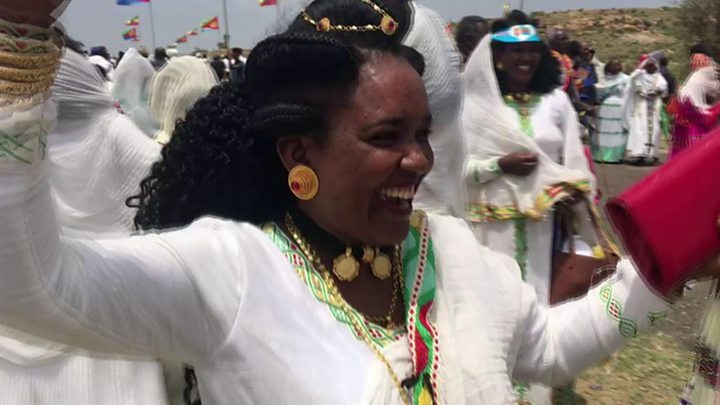 Ethiopians and Eritreans have been celebrating the reopening of two key crossing points more than 20 years after a border war shut them. Hundreds of people from the two countries hugged each other and some wept as their leaders led celebrations to mark the reopening. Ethiopia also announced that its troops would start withdrawing from the border area. These are the latest moves in the rapprochement between the ex-enemies. The reopening at Burre gives landlocked Ethiopia access to the sea. Another border post, near the Ethiopian town of Zalambessa, also reopened. It coincided with the Ethiopian New Year, adding to the festive atmosphere. "It's a wonderful day. I cam here to meet my relatives who I haven't seen for 20 years. We are so happy," Ethiopian Emmanuel Haile told BBC Tigrinya's Girmay Gebru in Zalambessa. "I have met my mother and my siblings after 24 years," another woman said. "I am so happy. I can't express my joy." The war, fought over the exact location of the boundary between Ethiopia and Eritrea, began in May 1998 and left tens of thousands of people dead. It ended in 2000 with the signing of the Algiers agreement. But peace was never fully restored as Ethiopia refused to implement a ruling by a border commission established by the agreement. What is the significance of the reopening? Families divided by the conflict are now able to visit each other after more than two decades. Eritrea won independence from Ethiopia in 1991 but members of the same family continued to live on both sides of the border as the two countries enjoyed good relations until 1998. The crossing at Zalambessa is on the main trade route linking the capital of Ethiopia's northern Tigray region with Eritrea's capital, Asmara. Its closure damaged trade, and consequently the economy in the border region suffered. The reopening of the border at Burre should allow Ethiopia to access Eritrea's southern port of Assab. What else has changed between the two countries? This is just the latest in a series of rapid changes as relations between Ethiopia and Eritrea have thawed. In July, Mr Abiy and Mr Isaias signed a declaration saying that the "state of war" between the two countries was over. Since then, phone calls and flights between the two countries resumed, and last week a ship registered in Ethiopia arrived in an Eritrean port. The two countries have also reopened their embassies in each others' capital cities. What will happen at other parts of the border? For now, only the land crossings at Zalambessa and Burre have reopened. The details about other parts of the 1,000km (620 miles) border still need to be worked out. The town of Badme, the flashpoint for the 1998-2000 conflict, was ruled to be in Eritrea by the border commission set up by the Algiers peace agreement. But until recently Ethiopia, which still administers Badme, refused to accept this. That changed when the two leaders met, but the town has not yet been handed to Eritrea. Prime Minister Abiy announced that Ethiopian soldiers would start pulling out from border areas, in compliance with the Algiers peace deal, but it is not clear when this will affect Badme. What happened to Zalambessa during the war? The border town was one of the main theatres of the conflict. During the two-year war, Zalambessa was occupied by Eritrean forces and, in the fighting, much of it was destroyed. But Eritrea has never contested that it is part of Ethiopia and its status is not controversial. What other changes have happened in the region? The rivalry affected the whole region, with Ethiopia and Eritrea normally taking opposite positions whatever the question. They took rival sides in Somalia's long conflict - Eritrea was accused of backing Islamist groups, while Ethiopia, a US ally, supported the internationally recognised government. That is now changing and last week Ethiopia, Eritrea and Somalia signed a cooperation agreement to restore peace and stability to the region. Eritrea and Djibouti also agreed to normalise relations after a dispute over their border had threatened to break out into war.